Please contact us to be placed on the mailing list for 2019. Registration for The Doane Woodcarving Experience 2019 will be open February 1, 2019 - July 10, 2019. Complete the following information and we will add you to our mailing list. Don't worry, we never sell or distrubute your information! Please note that classes fill up quickly. When you register for a class it is important to list your alternative choices on your registration form. Click on class names in orange to view a photo of the project. The Doane Experience offers a dynamic carving experience. Class sizes of approximately 8 to 12 students allow for individual attention from instructors. Students will meet their instructors the evening of July 21st. Classes unofficially start at this instructor meet and greet so bring your tools and plan to pay your instructor fees at that time. Students will experience 5+ days of carving and instruction. There will be opportunities for impromptu classes during the evening. Sign-up sheets will be posted at registration. Select vendors; The Woodcraft Shop, Moore Roughouts, and Loess Hills Sawmill will be onsite providing access to carving tools, books, roughouts, wood and much more. Throughout the week visitors are welcome to visit classes while they are in session. Many of these visitors are past attendees, or those interested in attending next year. There will be a Student Show Friday, July 26th displaying completed projects from all classes. 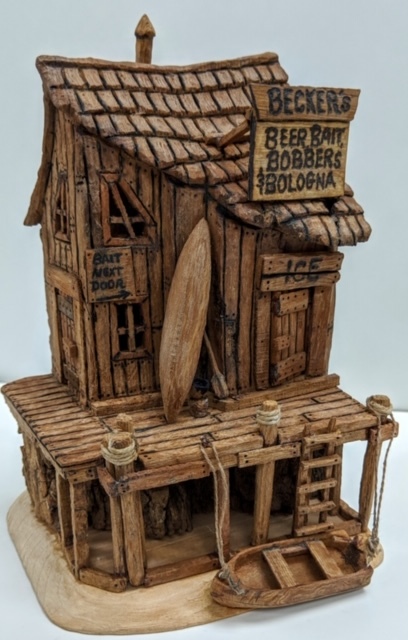 5 days of carving Cottonwood Bark Houses, with a twist. Students may carve houses in the round or as a wall hanging, creating their own designs. Making these houses unique, you will carve them more symmetrical, with much more detail, with opening doors, framed windows, and various chimney shapes. Bark sizes vary and you will be able to design and carve to fit the wood. Equipment and supplies will be outlined in letter to students. Instructor will furnish bark, and finishing materials Bark spoons and knives will also be available. Any type of piece may be carved: house, castle, lighthouse, etc. 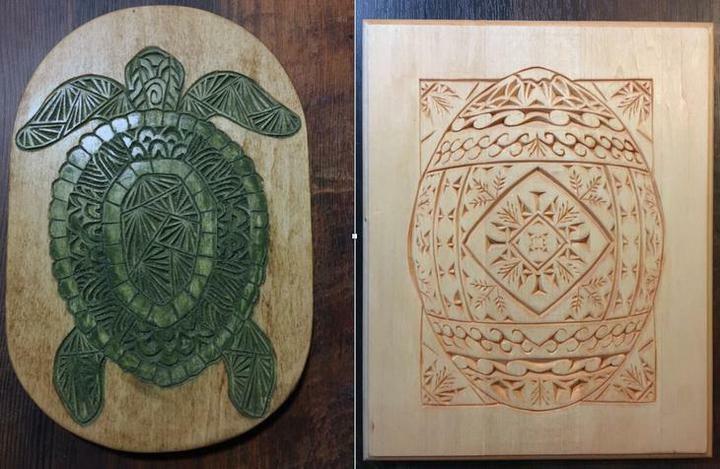 Instructor will demonstrate carving designs, techniques, and methods. 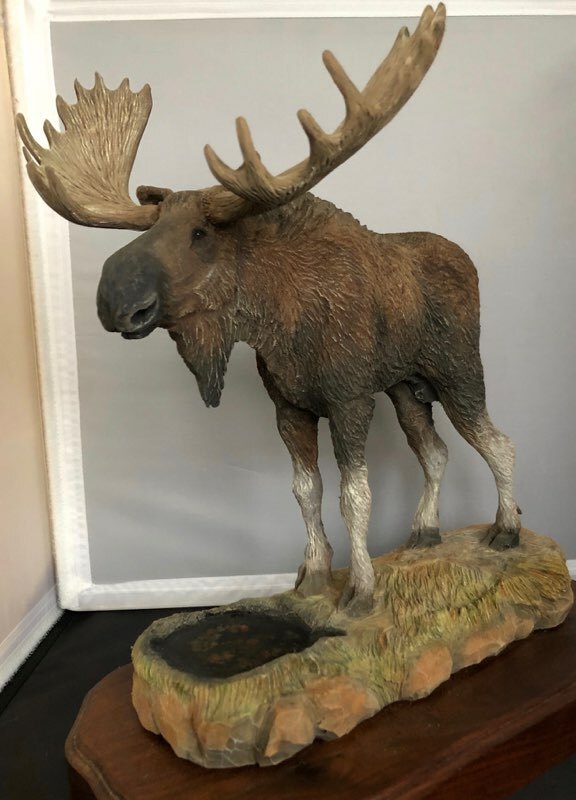 5 days of carving and painting a standing Moose on a base in basswood. We will use both power and hand tools –extension cords, dust collector and a good light are encouraged. A complete list of tools will be mailed to students. 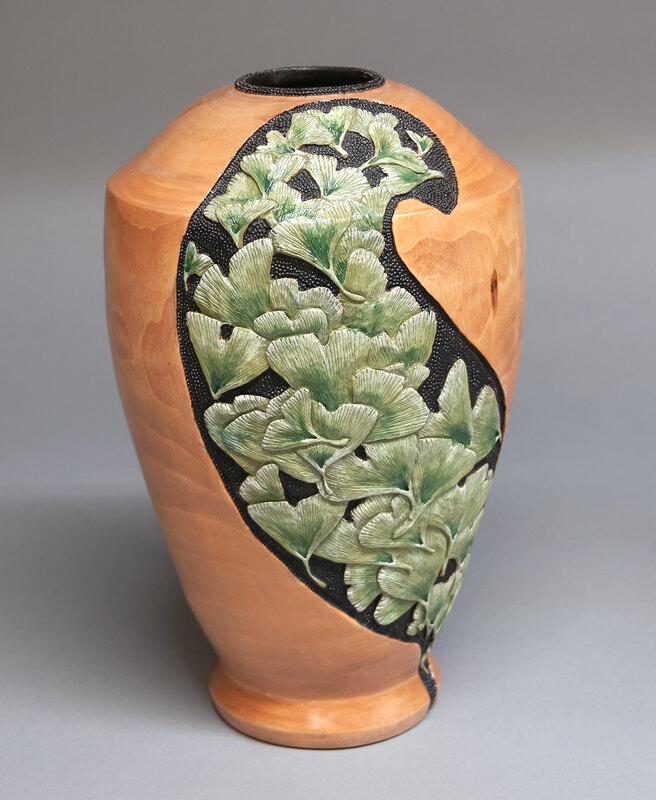 5 days of carving a basswood vase with Ginko leaves. The vase will be pre-turned and ready for you to design. Vase is 10 inches tall and over 5 inches around. This is a power carving class so dust collector and various power carving tools and bits will be used. 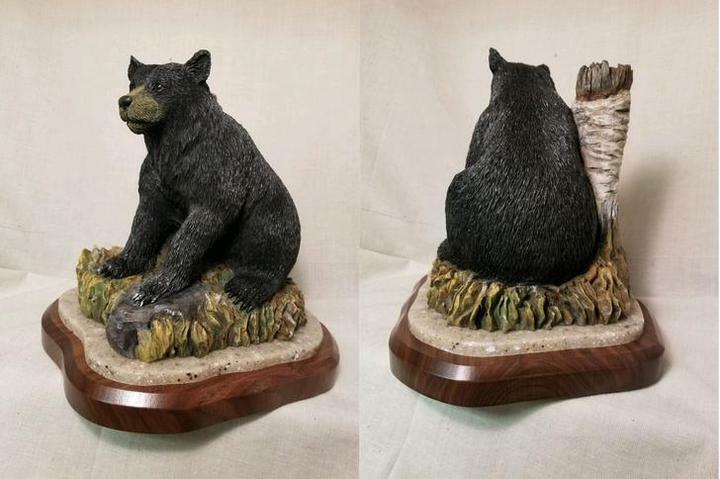 Instructor will provide a modified stump cutter in addition to paint, patterns and stain. Other patterns will be available. 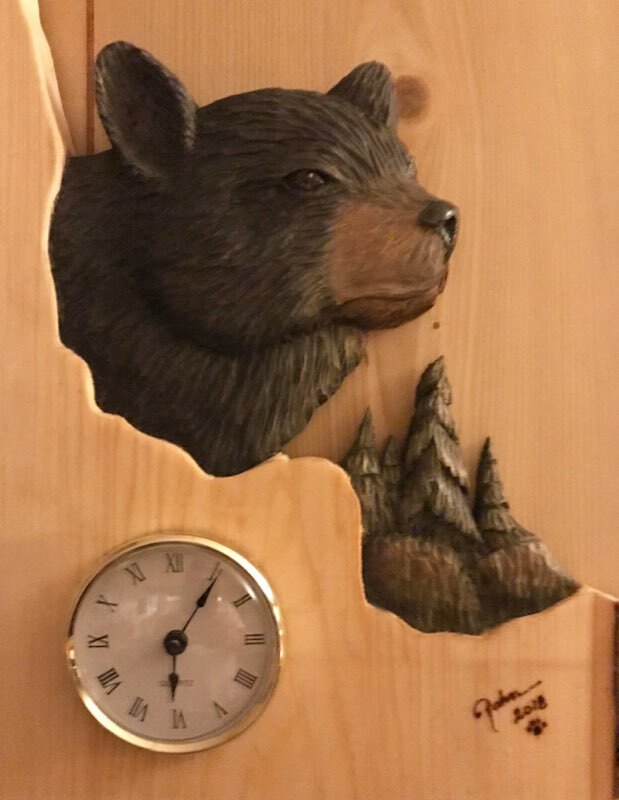 Learn pyrography (wood burning). 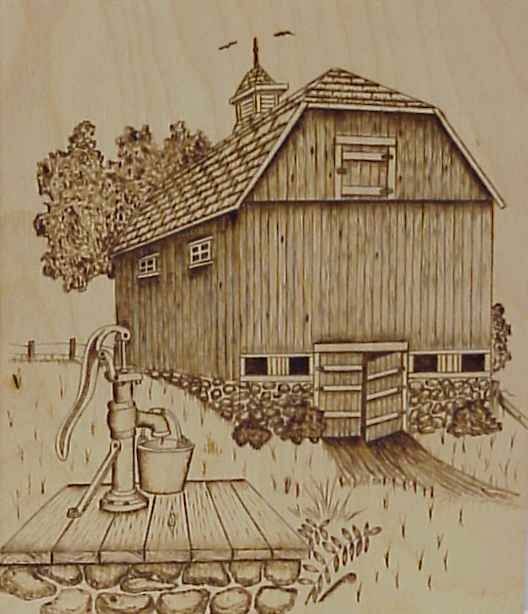 Beginners will learn the basics of wood burning with an emphasis on why and how the different pens and techniques work. 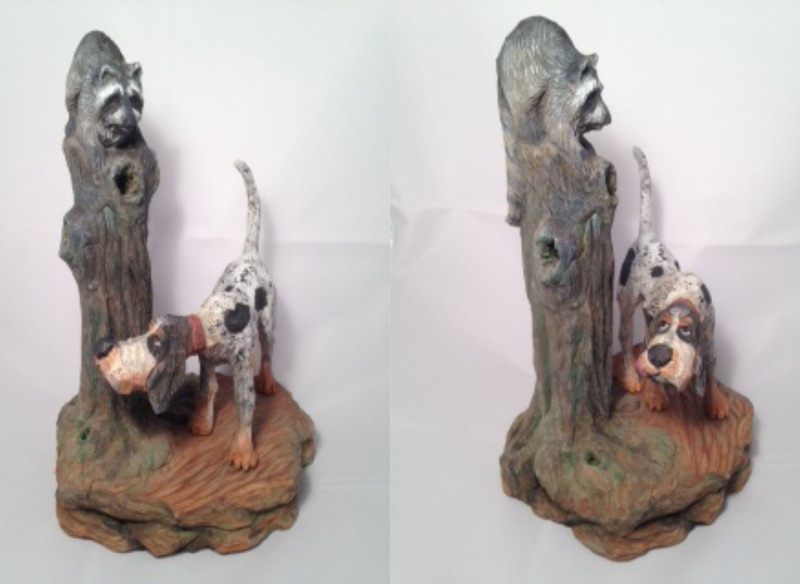 Emphasis will be given to soft shading, creating hair/fur, perspective, trees and foliage, shorelines and reflections. As students advance, they can choose a project from over 1,000 patterns or bring their own to work on. Projects can be completed on Italian Poplar, Basswood (either with or without bark), canvas bags, or gourds. Cost of materials for projects will vary from $1.00 to $20.00.Tools required: wood burner (instructor prefers Optima burners and pens, and will have them available in class), graphite paper, red ink pen, clear ruler, pencil, and eraser. A light may be helpful. Graphite paper, red ink pens, erasers and clear rulers will also be available for sale in class. 5 days carving a Santa with several pose options: Learn to carve an Old World style Father Christmas directly from a 4x4x10 Basswood block - no roughout or cutout. Carve a stylized Santa in an endearing sitting pose about 6” high - from a band sawn blank, or Carve a Cowboy Santa from a band sawn blank about 10” tall plus a floor and gift bag. 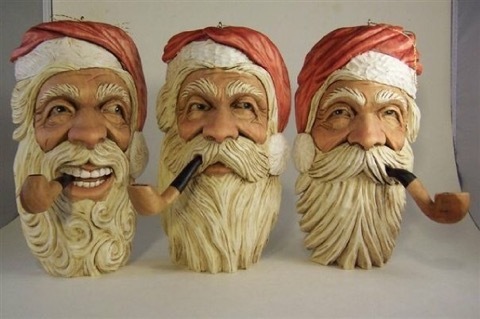 You can also chose to carve Santa ornaments with various levels of detail and hat choices from 2x2x4 Basswood or cottonwood bark. (several of these can be done in one week). 5 days of power carving Small Scenes in deer, elk or moose antlers. This class is designed to show how to make patterns and the basics of bone power carving. Students must provide their own Antler or Gunstock (no guns allowed) Power carving tools only, dust box, dust mask, lighting, etc. If student wants to do a moose antler it must be small in size and student will have to provide the antler. Instructor will provide small antler pieces and will send email. 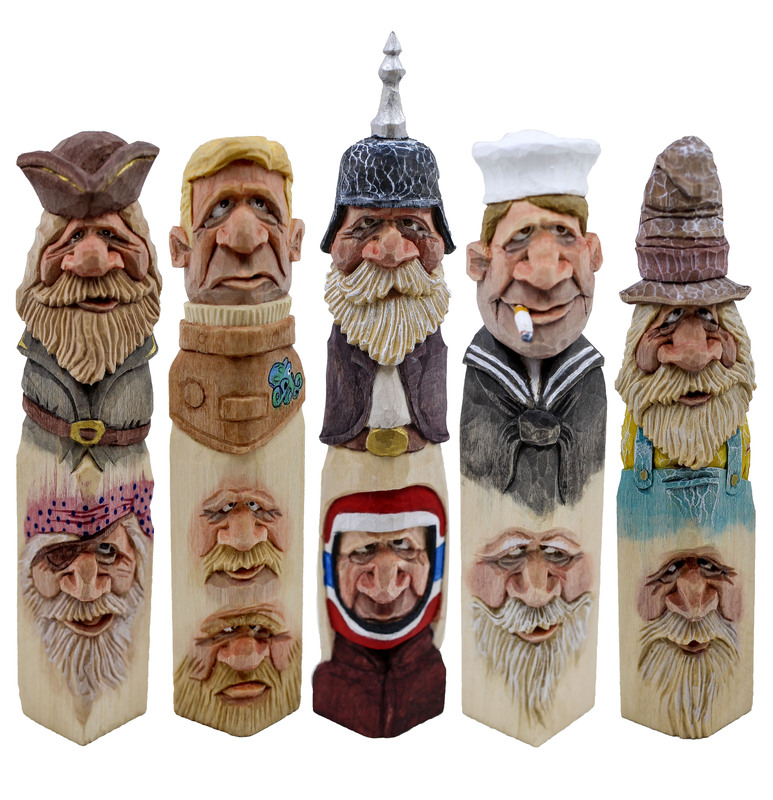 5 days of carving 2 projects starting from cutouts or rough outs, several to choose from. Projects will be a choice of fantasy, caricature, cowboys or Santa 3” to 12”. Students should bring gouges, knives, gloves, pencils, paint and paint brushes. Instructor will have projects to choose from. 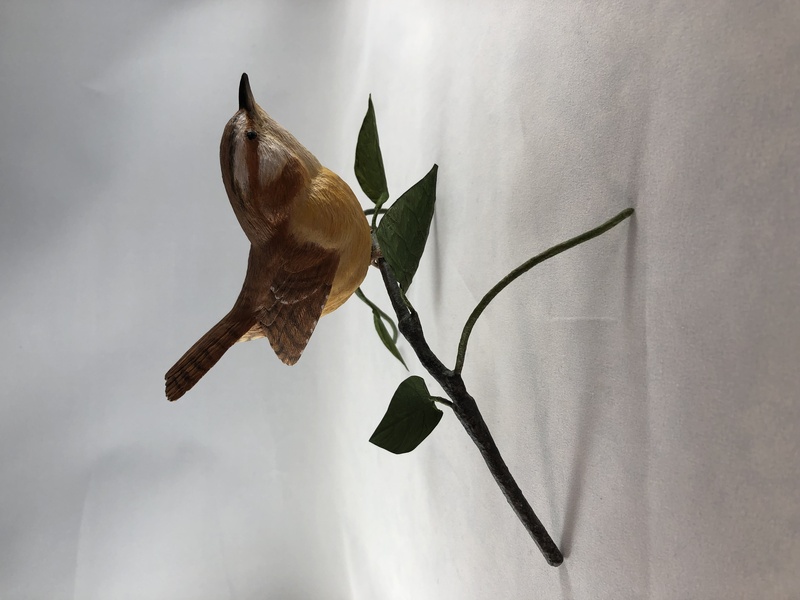 5 days of carving an adult Carolina Wren. Pattern, cutout, feet and eyes provided. Students will need to bring study photographs, a power grinder, dust collector, face masks, wood burner, knife, sandpaper, paint and brushes, ruler, pencils, and light. Students will also need to bring their own habitat. Instructor will send email. 5 days of carving a Santa face about 6 to eight inches tall from basswood block. Project will focus on construction and facial expression. Students need to bring sharp tools, carving glove, and notebook. 5 days of Chip Carving a plaque with lettering. The size will be roughly 9 x 8 or larger. Students should bring any chip carving tools and supplies they may have, including Deft or other lacquer spray, paints or special stains. Instructor will provide designs, spray adhesive, sandpaper, and stains. 17. Project Room - For those non-carvers who have their own projects they would like to work on while socializing with fellow crafters.